CODE3 is a German independent software vendor (ISV) that was founded in 2012. As a business, they develop and sell their “fireplan” software to fire departments all over Germany and other German-speaking regions. In essence, fireplan is an ERP for fire departments: it provides fire departments and municipalities the ability to document and bill any kind of incident and keeps track of educational and personal documentation, such as training schedules and health and equipment checks. By default, fireplan is installed on premise. Yet, the increasing proliferation of new device types (e.g. Mac OS or Linux), and the need for mobile access is also growing in fire stations. 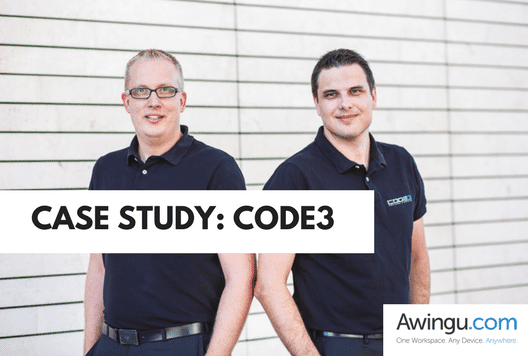 CODE3 used to leverage on Azure RemoteApp to provide mobile access to their end-customers. However, as of August 2016, Microsoft announced the discontinuation of the Azure RemoteApp service, meaning CODE3 needed to find a suitable alternative. No third party: Awingu is available as a software package. CODE3 runs and operates the software under their name, and in the infrastructure of their choice: Microsoft Azure. There are no additional contracts and processes needed with Awingu to comply with German privacy regulations. Scalability: Awingu can allow the company to grow at a faster rate because they would provide their upcoming products via the same channel – guaranteeing a smoother and less-disruptive implementation for current clients. Easy to manage: The setup of Awingu on Azure was very simple. CODE3 only needed to build on top of their existing platform. Speed: Municipalities are often still connected with low bandwidth connections and struggling with network restrictions. In fact, CODE3 had customers who couldn’t run fireplan because of connection issues. With Awingu’s bandwidth optimization, those issues were largely solved. Are you also an ISV looking for a replacement for RemoteApp Service? Awingu is your solution! Contact us or launch a 14-day free-trial!